Featuring artist quality collection of realistic and collectable wildlife Reptiles sculpture artist editions. • "Cast Stone", a unique artist's blend of durable, high strength and nontoxic artists' materials. Hand made in USA exclusively by Chris Dixon Studios. ...Thank You for your patronage. See the monochromatic tints for a price savings! • Artist edition of high strength and nontoxic 'Poxy-porcelain©'. ; Hand made in USA. Available in Brick Red, Terra Cotta, Yellow Ochre, Forest Green, Black, Chocolate Brown, Grey, White..
..shade of tone may vary. Specify Custom color in Comments when ordering! ; Hand made in USA. • All gators are made to order! •Must be shipped by freight! Crate:96x33x24@100#: CD-14-8OM-Alligat: : Crate = $257 + freight at market price, insurance is optional. Special delivery within Florida costs less! Pick up in SW Florida to avoid all crate & shipping costs! • All gators are made to order! •Must be shipped by freight! Crate:96x33x24@100#: CD-14-8CM-Alligat: : Crate = $257 + freight at market price, insurance is optional. Special delivery within Florida costs less! Pick up in SW Florida to avoid all crate & shipping costs! .• Big alligators are made to order! : CD-14-8OM-pp-Alligat: : Crate = $174 + Parcel Post at market price! Pick up in SW Florida to save all crate & shipping costs! 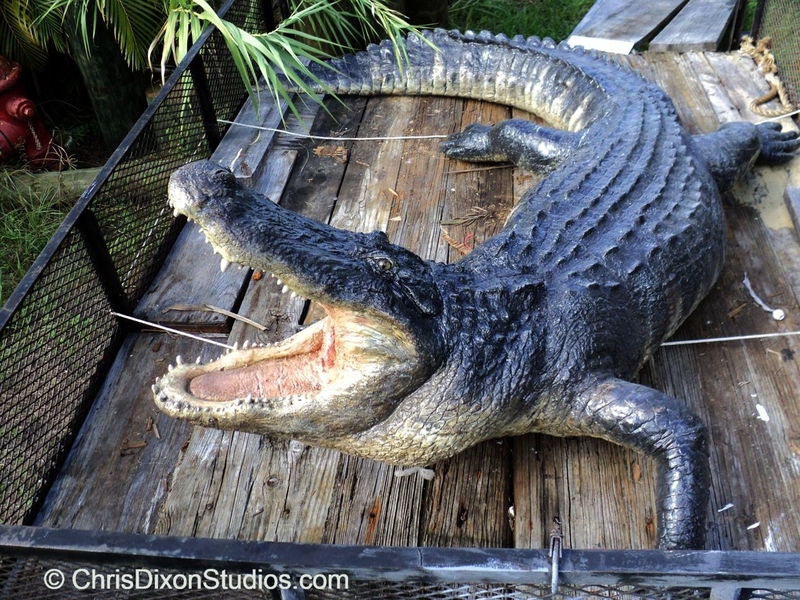 Alligator 8Ft in 6ft Parcel Closed Mouth: This 8 foot alligator is custom made to fit in a 2x6 foot parcel post box! Facing right is default position. Contact us for customizations. [contact for info.]. • Big alligators are made to order! : CD-CD-Alligat--Alligat: : Crate = $174 + Parcel Post at market price! Pick up in SW Florida to save all crate & shipping costs! Comes mounted on choice of black or white mailbox! Choose Color when ordering or you get whatever is in stock! Alligator can be custom painted also! • State of the art, high strength and nontoxic 'Poxy-porcelain©'. • Indoor - outdoor, light weight and scratch resistant - Absolutely Beautiful. • made in USA exclusively by Chris Dixon Studios.
. : CD-CD-Alligat--Alligat: : Crate = $174 + Parcel Post at market price! Pick up in SW Florida to save all crate & shipping costs!
. : CD-CD-Alligat--Alligat: : Crate = $225 + freight at market price, insurance is optional. Special delivery within Florida costs less! Pick up in SW Florida to avoid all crate & shipping costs!